Perthshire Timber Co. Dunkeld, is a family owned business founded in 1942 and has been trading successfully for over 60 years. Director and owner Iain Gordon, having studied and worked in Engineering and Computing, joined the business nearly 20 years ago. In 2005 Perthshire Timber co. achievied the a prestigious award and at the award presentation Iain told Comment, “the business is operating in an extremely competitive market and therefore a high level of efficiency is essential. Modern machinery requires a highly skilled workforce and continuous training is necessary as modifications and improvements are made to the log lines". "In this working environment there is a strong emphasis on health and safety. We are lucky to have such a good workforce. It is often said your best asset in your company is your workforce, and they are the reason we have been given this award”. 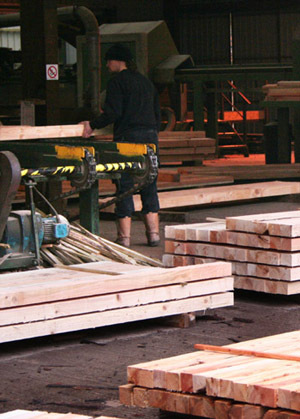 The sawmill employs over 20 staff and its core business is cutting and supplying boards, bearers and blockwood to pallet manufacturers throughout Britain. It also supplies fencing materials both locally and further afield, and can process large or small orders quickly and efficiently. Our mill is traditionally run, which requires a higher number of workforce but gives higher recovery, which is good for the enviroment. (Recovery is a measure of the sawn products produced out of a round logs). Larger chipper canter mills have less workers but produce a lower recovery. We are perfectly situated for the business we are in, as we are surrounded by our product with all the timber in Highland Perthshire and we have great road links with the A9 to the motorway network. Please phone 01350 727494 to check there are no local holidays.